you sweep into the dustpan. The New Moon in Libra takes to the night sky like a scythe. It is the season of Samhain (and by some calculations, Lunar Samhain) and Libra’s guardian planet of Venus arises in their form as Crone. We need the slow rumination and depth work of the Crone now more than ever in our time of quick clicks, soundbites, and the constant fear that you might not be keeping up, doing enough, being aware enough. Libra is a sign of harmony and it’s symbol the scales of justice. The voice of Libra this season moves away from the common Libran question of “Is it fair?” to a Libra which shouts, “No justice! No peace!” For justice should be a tool of harmony and from the harmonization of conflict we hopefully arrive at the Libran vision of peace. This is the Crone’s path of unbridled, shape-shifting, core-changing harmony. As it is the season of Samhain, we must remember that it is a traditional time of reconciliation at the Witch’s New Year approaches. And what is harmony but a radical reconciliation of all our parts into an whole? At the New Moon in Libra we have an opportunity to change that which needs changing in order to align our inner values with our outer actions. Libra is an cardinal air sign which means that it brings an energy of new starts and momentum to our lives. In pursuit of a life that feels just, that works for peace, and that feels like there is harmony between all parts of who you are, you are being asked to not depend on what others say or think you should be doing but to instead listen deeply and unflinchingly within for that which you know needs changing. Because the Crone doesn’t do what she does because she’s worried about getting dragged on twitter. The Crone builds mountains and tears down walls because they are connected to the certainty of who they are and their purpose. Are you? 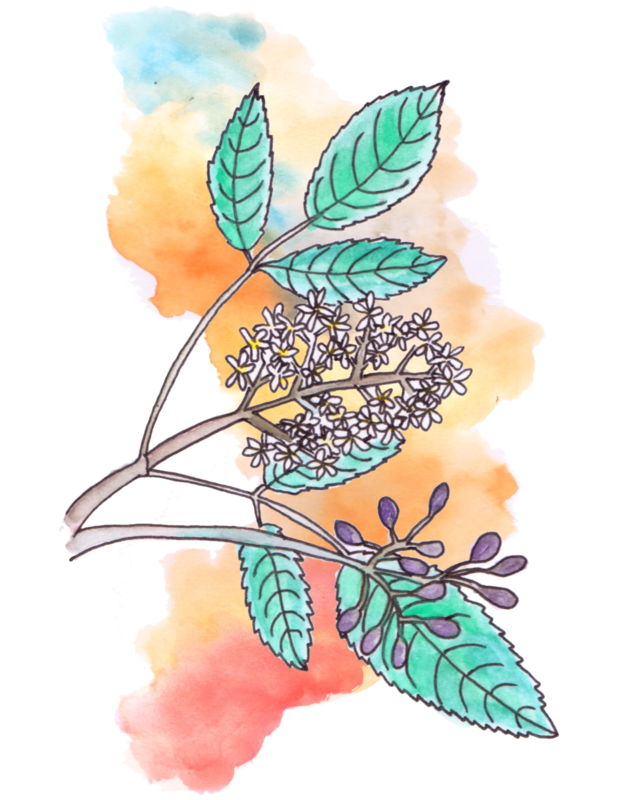 I’ve written about Elder many a time on this blog and it’s one of the herbs I recommend working with during for Samhain. And I just used it in my most recent tea recipe. So, I’m going to depart from the norm in this part of the New Moon Healer’s Project and focus solely on the magickal and spiritual gifts of Elder. Elder is traditionally classified as an herb of Venus. I see it specifically as an herb of Venus in Crone form. If you have worked with Elder, you’ve most likely met the fierce guardian spirit of the plant. As humxns we have been cultivating and using Elder since the stone age. She has raised us, kept us well, set boundaries to help keep us safe. The Elder has a decidedly take-no-fools attitude combined with a generosity of healing that is immeasurable. To sit with Elder is to say, “Ok, I don’t just want to get rid of this head cold - I want to learn about the coldness that haunts me in my heart.” And off you’ll go between the worlds (for Elder is a guardian of the gates between the worlds) and between your words and between the places you thought forgotten. If you’re ready to take up the scythe of the Crone in your life and cut away that which no longer serves you, add a jar of Elder berries to your altar. Sit with the Elder tree if you have one growing near you. Know that the Elder one will protect you on your journeying, but once you start down the path you must see it through to the end. For that is the promise of the Elder Mother - they’ll never abandon you, but they also won’t allow you to abandon yourself. Flower + Gem Essences for the New Moon of Libra : Chicory (Cichorium intybus), Lemon Balm (Melissa officinalis), Rabbit Orchid (Thelymitra antennifera), Vervain (Verbena officinalis), Yarrow (Alchillea millefolium), Agate, Peridot, Smokey Quartz, Rose Quartz. Essential Oils of Libra : Cardamom (Elettaria cardamomum),Cinnamon (Cinnamomum zeylanicum), Geranium (Pelargonium graveolens), Palmarosa (Cymbopogon martinii). Whether on the New Moon or at Samhain, perform this ritual to cut away that which no longer serves you. Be the Crone in your own life and stand on the foundation of who you want to be, not who you’re expected to be. Repeat this charm two more times and end with a “So Mote It Be.” You can continue to say the first chant and scan your body for more knots, cutting cords as many times as is necessary. Once the rite is done, thank the Crone in your way and be sure to spend time doing gentle self-care or going to bed for the night. With a divinatory tool of your choosing ask the following question. You can also ponder it during meditation or through journaling. How do I give my self-worth away? Where in my life to I bow to public pressure? What do I need to give up in order to be more me? Every card within the tarot deck has an astrological association. The following correspondences follow the system laid out by the Hermetic Order of the Golden Dawn. You can add these cards to your altar as part of your New Moon in Libra magick or use them in readings to help with determining celestial influence or timing (i.e. this will come to pass at when the Moon is in Libra). Find all of the New Moon Healers Project posts right over here. Be sure to share your insights and experiences in the comments below or via instagram with the tag #NewMoonHealersProject. Need more astroherbology in your life? You can learn more about the astroherbology of Libra by reading my in-depth profile on the sign. Check out the magick of each phase of the Moon. For those of you ready to learn how to live your magick and create your herbal remedies by the cycle of Moon and star, you're invited to join the The Lunar Apothecary. Blessed New Moon, wise healers. May your healing be healing to us all. May our healing be healing to you. Blessed be! Blessed be! Blessed be! We respect your privacy and will not share your information with anyone even if they are a crone. In the northern hemisphere we are in a time of growing shadows. The Sun's light is nearly harvested after Lughnasadh and Mabon. The fields are turning into the barren valleys of the Crone. As a practitioner of an earth-based spirituality, my personal daily practice is cyclical and seasonal (my Witchcraft + Weeds series is a great insight into the ways that I change my practice based on the seasons). As I prepare for the new year at Samhain, I follow the patterns of life and death that I see happening all around me. As the sun rises lower each day and the nights stretch on and no, the emerging shadows remind me of my own. Shadow work is the process of exploring the hidden parts of ourselves that affect our daily life in ways that we’d rather they not. Our shadow hides old wounds that haven’t quite healed and ways that past injuries have turned into present anxieties. Internalized and unexpressed pain find a home in the shadow. The shadow is actually an ally - but it can be hard to see it that way. Our shadow attempts to hide pain from us to protect us from feeling hurt. Hidden pain, though, becomes more powerful over time. Doing shadow work can be like meeting the monster under your bed -it's a creature that has terrified you all of these years but you come to find out that you had put them there in the first place. We often forget the origins of our shadows, because that is the nature of our mind, which is why spending time exploring our shadows when the veil between the worlds thins (including our inner worlds) can be so beneficial. I was first introduced to a structured form of shadow work via Christine Jette’s book Tarot Shadow Work: Using the Dark Symbols to Heal. It was the second book on tarot that I ever read and I dutifully worked through the exercises so that I could understand my inner psyche (oh, the ambitions of a thirteen year old witch). I learned some valuable skills that not only helped me in the confusing and complex years of teenage-hood, but the shadow is something I’m always looking for in my work with others (hello, lunar magick). Our shadows represent an opportunity for integration and finding the ways to help us match up our inner landscape with our actions in the world. Since it is the season of growing dark, what follows are a series of simple practices to introduce you to the tradition of shadow work. I hope you find that the practice brings you as much insight as it has me. And if you want more shadow work techniques, be sure to subscribe to my Magick Mail where you’ll get access to my member’s only site where I’ve posted additional resources for free (including my tarot spread for haunted hearts and clearing out old emotional ghosts). I love this practice! I believe I first learned it not from a tarot book but from the guidebook to Brian Froud’s The Faerie Oracle written by Jessica Macbeth (again, going down memory lane this was my first oracle deck I ever owned and it’s simply lovely). The exercise of finding and meeting your Shadow Card is simple but amazing to do. When many of us get a new tarot or oracle deck, we search through the cards noticing on the ones that speak to us and that we resonate with. We like to find our favorite cards. When seeking your Shadow Card you’re invited to look through your deck, but now you’re seeking the card that you like the least. I encourage you to choose only one card. There are going to be multiple cards in the deck that you find challenging, but one of the gifts of shadow work is learning how to focus and narrow your gaze. What don’t I like about this card? Are there certain symbols, expressions or characters in this card that I find hard? Does this card come up often for me or rarely in my readings? If I see this card as a true friend and teacher, what changes? What does this card tell me about myself? I recommend doing this exercise annually in the season of Samhain as your Shadow Card will often change. This is also a great practice to do at any time of the year if you’re having trouble pinpointing what it is that is bothering you in general or in a particular life situation. It’s also a fantastic practice to do in community and I highly recommend gathering together with your friends and finding your Shadow Cards together (preferably while drinking tea). If you’re interested in more tarot shadow work, be sure to sign up for my Magick Mail and get access to my Haunted Hearts tarot spread for free in the members-only Magick Mail Apothecary. As it is the Witch’s New Year, Samhain is a traditional time for reconciling differences between individuals. One of the ways that reconciliation is made possible is through sincere apologies. But apologizing can be hard, especially when our shadows prevent us from feeling sincere in owning up to our mistakes. Consider a place in your life that requires reconciliation. If there is nothing recent, think about something from further into your past. It should be a situation in which an apology on your part feels difficult. Pulling out your journal or a pen and paper, write about why you don’t want to apologize. It wasn’t that big of a deal. Well, they behaved worse than me. I don’t see what I did wrong. Why can’t we just forget about it and move on? Of course the above summary is short and simplified, but hopefully you get the idea of where you might journey in your explorations of your shadow. Once you’ve done the work of recognizing your shadow it will hopefully be easier to reconcile. Often reconciliation involves forgiving yourself first. I would recommend pulling a card or two that helps you connect with the healing potential of reconciliation. So you might choose the Two of Cups to help remind you of what your relationship with the person your in conflict is actually about - what of giving and receiving care and kindness. You might choose to reconcile in-person with the offended party or if that’s not possible, to write to them. Or if there is no way to reconcile with the person (because you’ve lost touch or they have passed or whatever), you can still write a letter and bury or burn it on Samhain with the intent of sending out reconciliatory energy. However you proceed, keep sincerity as your watchword and the hope of a untangled start your new year. What are your favorite shadow work techniques? Let me know in the comments. And remember, I've shared my newest tarot spread to my Magick Mail subscribers - so be sure to sign-up to get access to it. We respect your privacy and will not share your information with anyone no matter how shadowy.